Tekwurx uControl drives success in discovery and configuration data related projects. Customers use uControl to manage the accuracy and quality of configuration and discovery data. The uControl platform provides centralised management of distributed BMC Discovery deployments. It automates BMC Discovery updates and includes workflows for simplified and faster Application modelling. The goal for Tekwurx uControl is simple: To help our customers continuously discover all known and unknown assets within their IT estate and populate their CMDB with trusted, high-quality CI data. How do we understand what our asset baseline is? How do we keep Helix Discovery dynamically up to date with IP ranges? How can we make Helix Discovery discover what it doesn’t know about? How do we identify & quickly remediate discovery issues? Tekwurx uControl automatically tracks discovery issues, identifies gaps in data, finds issues affecting data collection and correlates discovered and non-discovered CIs to ensure you can trust your configuration data. Tekwurx uControl integrates disparate data sources to drive value from your existing investments. Out of the box integrations to Helix Discovery include CSV files, JDBC, API and ServiceNow. The application models created with Tekwurx uControl use a rule-based approach to identify service components from both discovered and non-discovered CI data. The rules automatically create actionable alerts to identify changes, possible root causes and suggested related components. uMap enables end-users to quickly and efficiently map application/service models through an easy-to-use UI. This automated solution reduces the amount of effort for modelling by 80 per cent and limits the need for outside expertise. As a result, the associated costs are dramatically cut. uChange allows users to understand changes to modelled applications and control any updates back within BMC Helix Discovery. Through an intuitive user interface, businesses can clearly see and manage any alterations to the application topography. The benefits of uChange’s automated application lifecycle analysis and updates include increased productivity and reduced BMC Helix Discovery management costs. 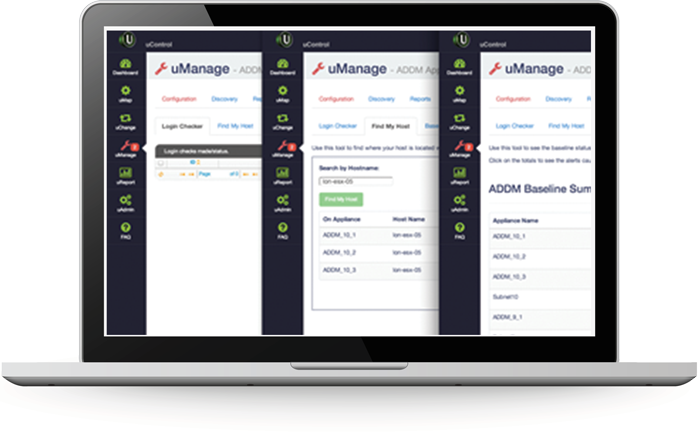 uManage provides greater control over the management and delivery of BMC Helix Discovery. The centralised and simplified management of all BMC Helix Discovery appliances ensures increased productivity and oversight. A key feature is the automation of best practice into a structured workflow, helping you make sure your team is working as effectively as possible. uReport enables users to analyse reports without the need to learn or use TPL language. Through the friendly UI, uReport quickly shows users what they need to know about their appliances and application architectures from a top-level view, right down to an in- depth analysis. This allows businesses to rapidly better understand their infrastructures and how to improve them. uPolicy provides the ability to set policies for BMC Helix Discovery, Security, Vulnerability, Change Control and Software via a simple user interface. uPolicy will raise an event when a policy is breached. uControl Teams provides the ability to allocate application mapping and remediation activities to the right team or individual and then track, and report on, progress. Give your organisation the ability to control, monitor and administer multiple Helix Discovery appliances from a central console thus reducing the amount of time required to check appliance status, health and discovery conditions and simplifying the roll out of updates, patterns and scanning control. Removes the need for you to learn TPL and instead enables applications to be modelled based upon a UI wizard – reducing the complexity of modellng and therefore the time taken to achieve results and the costs normally associated with this. Provide your end users with a self help portal for using and working with Helix Discovery in your specific environment. Access to common questions, requirements for success, infrastructure deployment and discovery – all tailored to you. Keep your application models current, up to date and in synch with your Application system of record by being alerted to application framework changes – enabling you to take the appropriate action. Out of the box and customer defined policies enable the use of Helix Discovery discovery data in setting and monitoring organisational compliance – and more importantly where compliance is not being met. Give your teams the confidence that they can rely upon the data you provide from Helix Discovery. Inbuilt gold data can be used to validate data being returned from your estate by Helix Discovery.